Edward Henry Jr., his lungs scarred by an incurable disease, thought it was a death sentence when he was told that he was too old to undergo lung transplant surgery. As Henry walked out, the surgeon’s pre-transplant coordinator took him aside. What she told him changed Henry’s life. Somebody could still help him: University of Florida Health. UF Health’s stature as one of the nation’s leading lung transplant centers continued to grow in 2018 as its surgeons and supporting personnel performed a Florida-record 70 transplants, surpassing the previous mark of 58 by Tampa General Hospital in 2010, figures by the federal Organ Procurement and Transplantation Network show. The program placed 10th in the nation and performed more lung transplants than any medical center in the Southeast with the exception of Duke University in North Carolina and its 97. The program’s one-year survival with a functioning lung was 90 percent, comparing favorably with the national average of 88.8 percent, despite the program often serving as the last resort for patients like Henry. Perhaps most remarkably, fewer UF Health patients died while on a wait list for a lung transplant than any other center in the nation that performs moderate to large numbers of transplants, just 4 percent of patients, according to the most recent figures. Part of the lung transplant team’s success is tied to its embrace of innovative technology, from its artificial lung program to a system allowing donor lungs to be improved before surgery. UF Health also is more aggressive than many others in accepting older patients, and those who are deemed too sick elsewhere for transplantation. 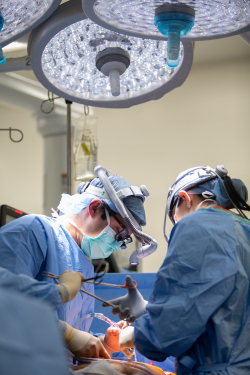 In fact, the transplant team performed surgeries on 24 patients age 65 or older in 2018, the most in the program’s history. Henry, who underwent a successful double-lung transplant in July, said UF Health’s program gave him a second chance at life. “The fact that it happened to me is another reason why people shouldn’t give up because what you’re giving up is your life,” the Destin resident said. Tiago Machuca, M.D., Ph.D., surgical director of the Lung Transplant Program and an assistant professor of surgery in the UF College of Medicine, credits the program’s continued emergence as one of the nation’s best to the expertise and dedication of a skilled multidisciplinary team and to its focus on innovative care. As the program’s reputation has grown, the numbers have followed, with patients from throughout the Southeast seeking out UF Health, in addition to increased referrals from physicians, he said. “I think that obviously comes from a huge effort from a very large team that is dedicated to lung transplantation,” Machuca said. That team includes nurses, physicians, physical therapists, social workers and others. Having a large number of patients makes everyone on the team more proficient and better at what they do, said Mauricio Pipkin, M.D., a lung transplant surgeon and an assistant professor in the UF College of Medicine. UF Health’s artificial lung program, started in 2015, and its support team, played a key role in the transplant team’s 2018 success. The team uses a device widely known by its abbreviated name, ECMO, short for extracorporeal membrane oxygenation. It oxygenates a patient’s blood while removing carbon dioxide, functioning as an external lung. ECMO is essential for patients awaiting a transplant because their lung capacity is so diminished. It also is used during surgery. The Extracorporeal Life Support Organization last year awarded UF Health its Gold Level ELSO Award for Excellence in Life Support for its exceptional care using ECMO in adult and pediatric cases. UF Health’s transplant team also takes a more aggressive approach in selecting donor lungs. About 75 percent of donor lungs are initially deemed unsuitable for transplantation because of problems such as impaired gas exchange or pulmonary edema. But those problems often can be reversed by using the XVIVO Lung Perfusion System, a technology that allows the lungs to be kept alive and improved so that they can become eligible for transplant. In addition, UF Health is one of just a handful of hospitals in the nation where surgeons can resize donor lungs through lobar transplantation. Traditionally, women and men of smaller stature have waited longer for lungs that will fit their chest properly since donor lungs are often from taller men who have suffered a traumatic injury. Machuca and Pelaez said they hope the UF Lung Transplant Program will continue to benefit an increasing number of patients suffering from advanced lung disease. Besides Machuca and Pipkin, the program expects to recruit a third lung transplant surgeon later this year and also is adding a transplant pulmonologist.